Usually used for home installations and power systems. In house installation used size 1.5 mm2 and 2.5 mm2. 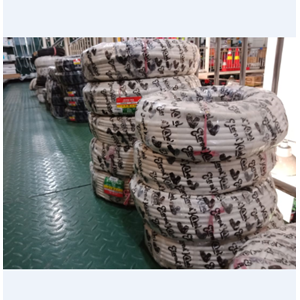 Single-core, PVC-coated insulating material, and often for installation of air cables. Color codes of isolation are red, yellow, blue and black. Cable type is commonly used in housing because the price is relatively cheap. Layer electrical cable isolation only 1 layer so easily defective, not waterproof and easily bitten by rats. To be safe to use this type of cable, the cable must be installed in a PVC conduit / conduit type or closed channel. So it is not easy to become a target of rat bites, and if there is a peeling insulation is not directly touched by people.